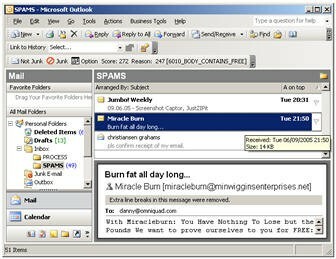 Spam Eliminator 2.04 is anti-spam & anti-spy tools software developed by C Point Pty Ltd. Junk all your junk mail - automatically, while letting your legitimate mail in. Spam Eliminator is an intelligent plug-in: it gives you great protection from spam and ensures you receive all genuine messages by using the combination of filtering and performing fast content analysis. This security & privacy software is shareware, which means you can download and use Spam Eliminator 2.04 for free during the trial period (usually for 30 days). At the expiration of the period you will have to buy the anti-spam & anti-spy tools product for $29.95. Spam Eliminator 2.04 is available at regnow and C Point Pty Ltd website. Spam Eliminator 2.04 supports different languages (including English). It works with Windows 98/XP/Vista. We have tested Spam Eliminator 2.04 for spyware and adware modules. The software is absolutely safe to install. Our website has thoroughly tested security & privacy product Spam Eliminator 2.04, written the review and uploaded installation file (7352K) to our fast server. Downloading Spam Eliminator 2.04 will take minute if you use fast ADSL connection.